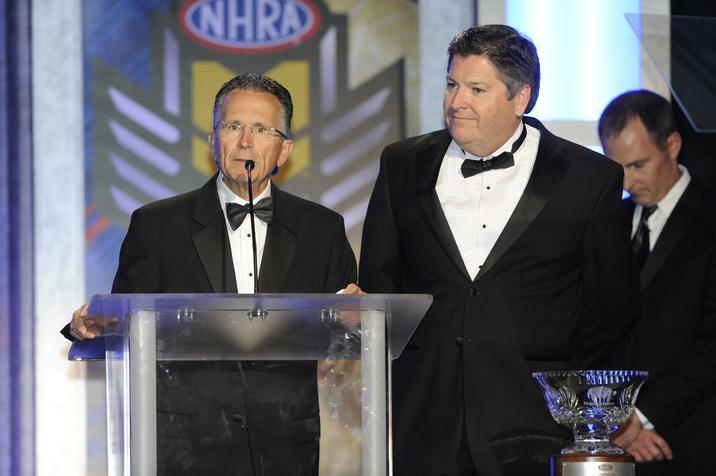 Dodge and Mopar were awarded the 2016 NHRA Manufacturers Cup this week at the NHRA Mello Yello Drag Racing Series awards ceremony in Hollywood. Don Schumacher Racing Mopar Dodge Charger R/T Funny Car driver Ron Capps, fresh off of winning the Funny Car championship at the NHRA Finals, was one of the driving forces for Mopar’s first Manufacturers Cup in 46 years. “It is a great honor for the Mopar and Dodge brands to receive NHRA’s coveted Manufacturers Cup,” said Pietro Gorlier, Head of Parts and Service (Mopar), FCA Global. “This award is very meaningful for us, particularly since it has been a number of years since we’ve reached this goal. On behalf of Mopar and Dodge, I extend our gratitude to the drivers and teams that contributed to this monumental victory. Their dedication to Mopar power and the tremendous effort that they put forth, both in the race shop and on the racetrack, have made this possible. “We also thank the loyal fans that support and cheer for these drivers and the NHRA for providing the arena for us to showcase the power and speed of the Mopar and Dodge brands at the drag strip,” Gorlier added. Capps and teammates Matt Hagan, Tommy Johnson Jr., and Jack Beckman were key to Dodge and Mopar’s success, as was Dodge Dart Pro Stock driver Allen Johnson. At the end of the season, Dodge drivers took home victory at 15 national events, including 14 Funny Car competitions and nine all-Mopar final rounds; Capps won five races, Hagan won four, Johnson Jr. won three, and Beckman won two. Johnson won the Pro Stock championship at the Mopar Mile-High NHRA Finals.